On the evening of August 22, 1922, a small military convoy carrying 31-year-old Michael Collins was driving along the war torn roads of County Cork, Ireland. Collins was deeply troubled. What should have been the happiest summer of his life had turned into the most tragic. The previous December, Collins had helped negotiate a treaty in which Britain, after 750 years of occupation, had finally agreed to withdraw from the 26 counties of southern Ireland. Within a few months of the treaty, however, Ireland was engulfed in a civil war in which the Irish Free State Army, which supported the treaty, was fighting the Irish Republican Army (IRA), which opposed it for failing to include the northern counties. In an attempt to put an end to the war, Collins, who had been the IRA’s director of intelligence and who was now the commander in chief of the Irish Free State Army, had gone to Cork. When asked about the dangers, Collins had replied that ‘my own fellow countymen won’t kill me.’ He probably knew he was wrong. As the lightly armed convoy made its way along the lonely Irish roads, Collins was killed in an IRA ambush. The repercussions of that evening are still being felt in Ireland to this day. Although his image as a legendary and romantic hero or a prototypical terrorist depends on one’s point of view, there is little disagreement over Michael Collins’ being a tragic figure in the end. As the military and political genius behind the IRA’s fight for Irish independence, he led a small force of guerrillas to fight the British empire, which at the time was the world’s mightiest power, to a stalemate and forced the British to the negotiating table. The tactics that he developed and perfected caused him to be widely regarded as the father of 20th century urban guerrilla warfare. Future revolutionaries such as Vladimir Lenin, Mao Zedong and Yitzak Shamir studied and adopted Collins’ tactics. In fact, Shamir admired Collins so much that he used the code-name Michael during the Israeli war of independence. All of Collins’ biographies state that he was born in Woodfield, County Cork, on October 16, 1890, although it is interesting to note that his tombstone presents it as October 12, 1890. His father, who had married at age 60, was 75 at the time of Michael’s birth, the youngest of eight children. Michael’s father died in March 1897. Collins’ first job since his release was with the Amalgamated National Aid Association, an organization devoted to providing aid to widows, orphans, and dependents of those who were killed or imprisoned in the Easter Rebellion. While doing that, Collins made many contacts that would prove extremely useful over the next few years. In February 1917, Collins became a member of the IRB’s Supreme Council of the IRB and shortly thereafter, he became its secretary. Two years later, in the summer of 1919, Collins was elected president of the IRB. In October 1917, Eamon de Valera, the senior surviving leader from the Easter Rebellion, was elected president of Sinn Fein. At the same time, Collins was elected to the Sinn Fein Executive Council. A few days later, de Valera was re-elected president of the Irish Volunteers and Collins became their Director of Organization. Collins became adjutant general of the Irish Volunteers in March 1918, and a few months later, he also became the director of intelligence for the Volunteers. It was as director of intelligence that Collins established a vast intelligence network that operated throughout Ireland and England. He had spies and informers everywhere including the police, the British army and even in Dublin Castle, which was the British administrative center in Ireland. His spies allowed him to intercept British messages and there were numerous occasions where Collins had copies of British orders before they reached the intended recipient. On April 3, 1918, Collins was arrested in Dublin for a speech that he had given in County Longford. Collins posted bail and went on the run. During the next three years, he was the most wanted man in Ireland. On May 18, the British arrested the leadership of Sinn Fein, including de Valera, leaving Collins to assume almost total control of the republican movement. In December 1918, just a month after World War I ended, there was a general election of the British Parliament. Since Ireland was part of the United Kingdom, elections were also held there. The result was that the Sinn Fein Party won 73 seats, the Unionist Party (members from northern Ireland who wanted to remain part of the United Kingdom) won 26 seats, and the Irish Parliamentary party, which had been the dominant party in Ireland, only won six. Collins was elected to the British Parliament on a Sinn Fein ticket. The Sinn Fein members refused to go to London to take their seats. Rather, they set up their own Parliament in Dublin. Since they were essentially setting up a separate government, the British viewed their actions as treason. The Irish Parliament (called the Dail) held its first meeting on January 21, 1919. On that same day, a small group of Irish Volunteers attacked a police transport at Soloheadbeg, in County Tipperary, killing two policemen. Most historians use that incident as the start of the War of Irish Independence, or as it is more commonly known, the Black and Tan War (referring to the black and khaki uniforms worn by the Irish paramilitary forces that enforced British rule at the time). During this period, the Irish Volunteers renamed themselves the Irish Republican Army. A few months later, in addition to his duties with the IRA, Collins was appointed Minister of Finance for the Dail, but he was not present for its first meeting. He was in England at the time, working on a plot to spring Eamon de Valera out of Lincoln Jail. The plot proved successful and on February 3, 1919, Collins personally participated in de Valera’s escape. Collins was back in Dublin by March 29, when he organized a mass escape of about 20 prisoners from Mountjoy Prison. Although there were regular British troops stationed in Ireland at that time, the British primarily used the Royal Irish Constabulary (RIC), and the Dublin Metropolitan Police (DMP) to rule the country. The RIC was a paramilitary force that was stationed in barracks, armed with rifles and had spies and informers in every village and town throughout Ireland. Somewhat surprisingly, the RIC was composed primarily of Irish Catholics. The DMP had seven divisions. Divisions A-D operated in Dublin, Divisions E-F operated outside the city, and Division G was its intelligence unit, composed of plainclothes detectives. On the night of April 7, 1919, Collins, with the assistance of one of his spies, sneaked into G Division Headquarters and spent the night examining top secret files. After viewing them, Collins concluded that the key to defeating Britain was to cripple its intelligence network. He wrote that England could replace every soldier that was killed but that, without her spies, she was helpless. He also realized that spies are less willing to replace spies that have been killed and that, even if Britain could find replacements, the new spy would not have the previous spy’s knowledge. Therefore, Collins began a sustained and systematic attack on both the RIC and G Division. To fight the RIC, Collins used the IRA flying columns-small but highly mobile guerrilla groups of poorly armed men, usually no more than 30. 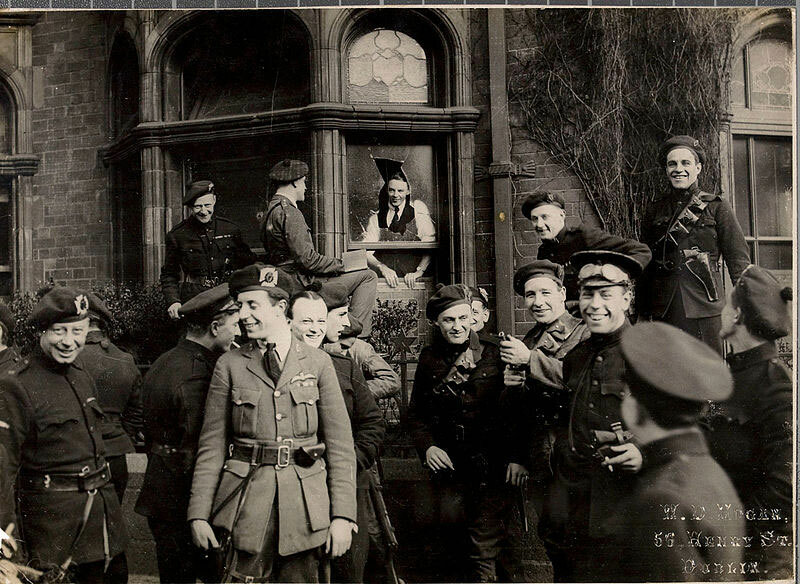 On April 20, 1919, the IRA staged its first raid on an RIC barrack, seizing rifles and ammunition. During the next few months, the IRA intensified its attacks on the RIC. As a result, some of the smaller RIC barracks were closed and the troops were transferred to larger barracks in the cities and towns. To fight G Division, in July 1919 Collins organized a small group of young volunteers assigned to the IRA’s Intelligence Department, known simply as the Squad, whose mission was to assassinate detectives and other British spies. The Squad usually gave potential targets a warning and, if they responded by performing their duties less zealously, they were spared. Those who failed to heed the warning were usually killed. The Squad’s first victim was Sergeant Patrick Smith, who had ignored several warnings before being killed on July 30, 1919. One of the things that caused the British to fear Collins the most was the relentlessness and success with which he tracked down his enemies. For example, when the Irish were being rounded up at the end of the Easter Rebellion, Collins saw one of the British officers, Lea Wilson, mistreated several of the prisoners, including its eldest leader, 58-year-old Thomas Clarke. Collins remembered the incident and swore to avenge it. In June 1920, more than four years after the rising, Collins learned that Wilson was working as an RIC district inspector in Gorey, a small town in County Wexford. On June 15, Collins had Wilson killed. Another RIC district commissioner, Ferguson Smyth, had advocated a shoot-on-sight policy against the IRA. Commissioner Smith was tracked down and killed by the IRA on July 18. When the Lord Mayor of Cork, Tomas MacCurtain-who was also the leader of Cork No. 1 Brigade of the IRA-was killed by the British on March 20, 1920, Collins learned that RIC District Inspector Oswald Ross Swanzy was one of those responsible. The British, in an effort to protect Swanzy from IRA reprisals, transferred Swanzy from Cork, which is in the southernmost part of Ireland, to Lisburn in the north. However, Collins’s vast intelligence network was able to track Swanzy down and a special hit team was dispatched to kill him. They achieved their objective on August 22, as Swanzy was coming out of church. The single most devastating attack on the British occurred on November 21, 1920. Late in the year, the British sent numerous secret service agents to Dublin in an attempt to infiltrate the IRA high command and to kill or capture Collins. Six days later, Arthur Griffith, who was president of the Dail, was arrested and Collins then became its acting president, as well as its minister of finance for the president of the IRB, and director of intelligence, director of organization and adjutant general for the IRA. In December, the British sent out word that they were looking for a peaceful resolution of the Irish situation. On December 17, however, the British insisted that the IRA would have to surrender its weapons before any talks could begin. Collins rejected the demand. During the Black and Tan War, Collins had numerous escapes that only added to his legendary status. On several occasions, his offices were raided and he narrowly escaped by running out the back or running up to the rooftop. On several occasions, he was stopped and questioned by the British, but they failed to recognize him, primarily because they did not have a good photograph. Part of his success, however, came from his sheer audacity. There were numerous times that he approached the British at checkpoints and asked what was going on. Although he was the most wanted man in Ireland, he never wore a disguise. Rather, he dressed as a businessman, wearing a suit and tie as he rode his bicycle throughout Dublin. Collins also relied for his safety on his vast network of friends and spies-and his reputation for ruthlessness. Most of the Irish supported Collins and those that didn’t support him realized that, had they turned him in, they would not live to spend the reward money. 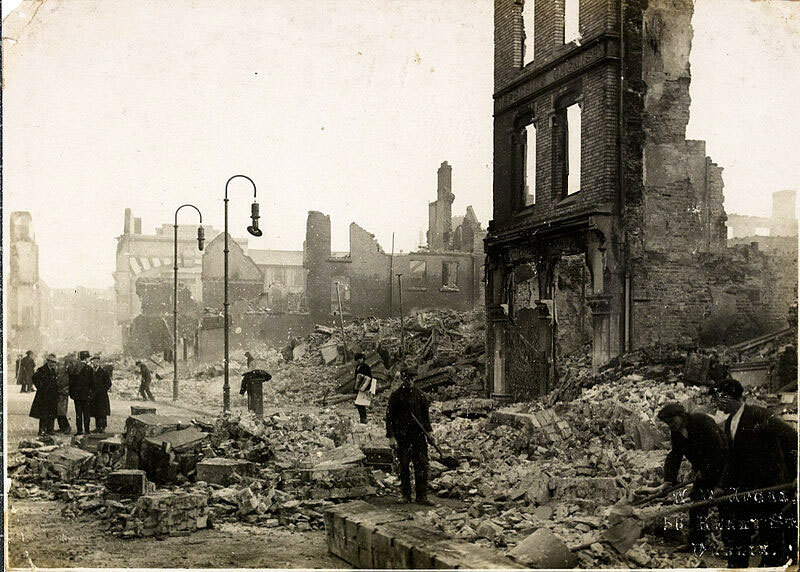 On May 25, 1921, the IRA launched its biggest operation of the war when 120 men attacked and burned the Custom House in Dublin. It proved to be a costly operation, with six IRA men being killed, 12 wounded and 70 captured. Despite its apparent failure, however, the attack did have a decisive psychological impact on London. On June 22, King George V, in a speech in Belfast, proposed peace talks and on July 11, a truce was declared. Treaty negotiations started in London on October 21. Among the British negotiators were David Lloyd George and Winston Churchill. Eamon de Valera sent Collins as one of the five Irish delegates. Collins strongly objected, feeling that, as a soldier who had fought the war, it was not his position to negotiate the terms of any treaty. He also stated that the task of being a delegate was a loathsome one, but that he went ‘in the spirit of a soldier who acts against his judgment at the orders of a superior officer.’ Once Collins became a member of the treaty delegation, however, he became totally committed to working for a peaceful solution. During the negotiations Collins, a devout Catholic, arose early each morning to attend daily Mass. After more than six weeks, the parties finally reached a compromise agreement on the morning of December 6. Although the treaty did not provide for a complete and free Irish Republic, it did create the 26-county Irish Free State, which had dominion status, leaving the six counties of Northern Ireland as part of Great Britain. As Lord Birkenhead signed the treaty on behalf of the British delegation, he remarked, ‘I may have signed my political death warrant tonight.’ Collins, realizing that many diehard IRA members would oppose any compromise with Britain, grimly replied, ‘I may have signed my actual death warrant.’ The proposed treaty still needed to be ratified by the Dail. When the Irish delegation arrived back in Dublin, it found its parliament split over the issue. Those who opposed the treaty did so because it did not establish an Irish Republic, only giving Ireland dominion status, and because it required the Irish to take an oath of allegiance to the British crown. In light of future events, it is amazing that the partitioning of Ireland was not a major issue. The debates, in which Collins and his supporters backed the treaty and Eamon de Valera and his supporters opposed the treaty, were extremely bitter. On a number of occasions, Collins was accused of treason and cowardice. (TREATY DEBATE) Finally, after a month of heated arguments, the treaty was approved on January 7, 1922, by a vote of 64-57. After the vote was taken, de Valera and his supporters walked out of the parliament-thereby taking the first steps that would ultimately lead to civil war. Arthur Griffith was then elected president of the parliament and Collins was appointed minister of finance. However, in addition to the Irish parliament, the Irish also had to set up a provisional government to handle the transfer of power from the British to the Irish. Collins became chairman of that provisional government. The walkout by de Valera and his supporters led to the breakup of the Sinn Fein Party into the pro-treaty and the anti-treaty factions. In fact, the two main political parties in Ireland today can trace their origins to that event. Those who supported the treaty would eventually form Fine Gael, while de Valera and his followers would end up forming Fianna Fail. Unfortunately, the political differences also extended to the IRA, which broke into two separate factions. Those that opposed the treaty retained the IRA name (although the government referred to them as the irregulars) and those that supported the treaty and remained with the government became known as the Irish Free State Army. During the next few months, there were isolated incidents of violence between the two factions and on April 14, the IRA seized the Four Courts, which was the Irish judicial center in Dublin. The Irish Civil War started on June 28, 1922, when the Free State Army attacked the Four Courts and swiftly seized control of Dublin. The IRA, however, controlled much of southern and western Ireland. Once the Civil War started, Collins became commander-in-chief of the Irish Free State Army (technically, it was the National Army, since the Irish Free State did not come into existence until December 1922.) Over the next few weeks, the Free State Army drove the IRA from its strongholds. The biggest victory occurred when the Free State Army made an amphibious landing outside of Cork city, taking the IRA completely by surprise and driving it into the surrounding countryside over the next few days. On August 20, Collins left Dublin for an inspection of Cork. He arrived in Cork later that evening and spent the next day meeting with commanders. On August 22, he departed the city to tour western County Cork. Around 7:30 p.m., his small convoy entered a little valley called Beal na mBlath, which was only about 15 miles from where he had been born. 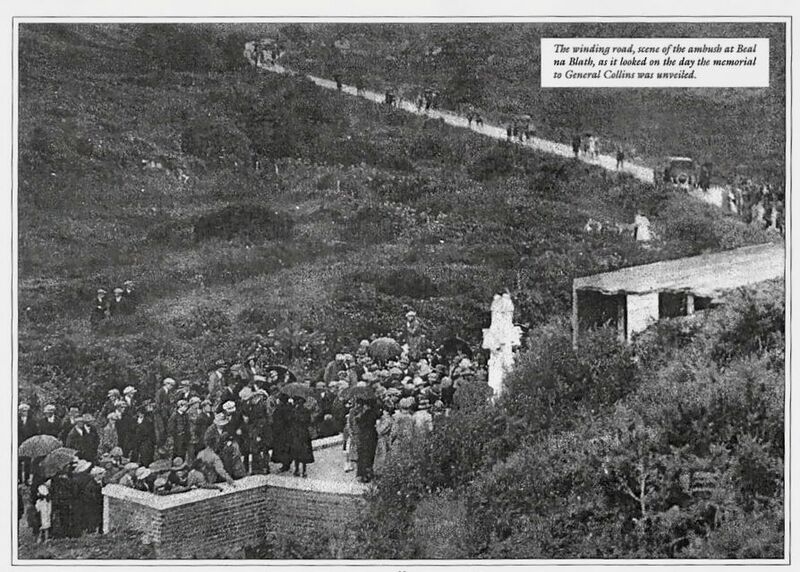 A small group of IRA men had heard that Collins was in the area and had set an ambush for him. Shots rang out from the hillside and in the short gun duel that ensued, Collins fell dead. It was the supreme irony that the man who had perfected guerrilla warfare and who had escaped death numerous times at the hands of the British would be killed in a guerrilla ambush by his former comrades in his home county. The civil war continued until May 1923, when the IRA declared a cease-fire. Even though the Free State Army had clearly won, the IRA never officially surrendered. Instead, it took the fight into the political arena and in 1932, Eamon de Valera, who had been the leader of the losing side in the conflict, was elected prime minister. De Valera, or his party, would remain in power for most of the next 50 years. As a result, much of the history books written during that period portrayed Collins in an unfavorable light. Since de Valera’s death in 1975, however, there has been a renewed interest in Michael Collins by people have only recently begun to appreciate what he did for their country. In fact, in a poll conducted by the Irish Times as part of the millennium celebration, Collins was voted the republic’s man of the century. Even today, Collins remains the most controversial and polarizing figure in Irish history. To his supporters, he is a combination George Washington, Abraham Lincoln, Ulysses Grant, and John Kennedy, having led the Irish both politically and militarily in their revolution and in their Civil War, only to be martyred at an assassin’s hands. Those who oppose Collins view him as a Benedict Arnold who betrayed the goal of an Irish Republic. While it is true that Collins settled for less during negotiations, however, he viewed the settlement establishing an Irish Free State as a stepping stone toward complete independence. Collins stated during the treaty debates that the treaty ‘gives us the freedom, not the ultimate freedom that all nations desire and develop to, but the freedom to achieve it.’ Future events proved him correct, for in 1937, under de Valera’s leadership, Ireland adopted a new constitution that abolished the Irish Free State. The country became known as Éire and declared itself a’sovereign independent democratic state.’ Finally, on April 18, 1949, the Republic of Ireland was established and formally severed all ties to the British crown and the Commonwealth. One is only left to speculate what Michael Collins would have been able to accomplish had he lived and been able to govern Ireland during peacetime. It is safe to say that the course of Anglo-Irish relations would have been much different had he lived and that, perhaps, the problems of Northern Ireland would have been solved long ago.